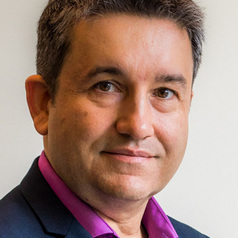 Alfred Hermida Ph.D. is co-founder of The Conversation Canada. He is an award-winning author, online news pioneer and media scholar, with two decades of experience in digital journalism. He is an associate professor and director of the School of Journalism at the University of British Columbia, where his research explores the digital transformation of media, social media and data journalism. He is author of Tell Everyone: Why We Share and Why It Matters, winner of the 2015 National Business Book Award. He is co-editor of The Sage Handbook of Digital Journalism (Sage, 2016) and co-author of Participatory Journalism: Guarding Open Gates at Online Newspapers, (Wiley-Blackwell, 2011). His research has been published in Journalism Studies, Journalism Practice, Digital Journalism and the Journal of Broadcasting and Electronic Media. A founding news editor of the BBC News website in 1997, he spent 16 years working for the BBC in television, radio and online, including four years as a correspondent in North Africa and the Middle East. Among his numerous awards are a Canadian Online Publishing Award for best blog for Reportr.net in 2010 and a 2011 UBC President’s Award for Public Education Through Media. In 2011, he was recognized by the Digi Awards as one of Canada’s top three social media mavens. Alfred Hermida Ph.D. est cofondateur de The Conversation Canada. Il est un auteur primé, un pionnier de l’information en ligne et un spécialiste des médias avec deux décennies d’expérience en journalisme numérique. Il est professeur associé et directeur de l’école de journalisme de l’Université de Colombie-Britannique, où il s’intéresse à la transformation numérique des médias, les réseaux sociaux et le journalisme de données. Il est l’auteur de «Tell Everyone: Why We Share and Why It Matters». Participatory Journalism: Guarding Open Gates at Online Newspapers, Wiley-Blackwell.